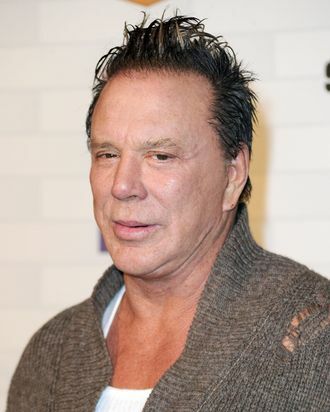 Mickey Rourke is well known for speaking his mind after he’s made a movie, and unlike stars who promote their new releases in a conventional manner, Rourke is liable to call his film “a really bad movie” or suggest “I don’t know if you’d even want to watch a slideshow of that.” This time, though, Rourke is dissing a movie he hasn’t even made and now, won’t: Martin McDonagh’s Seven Psychopaths, a black comedy he was added to a few weeks ago alongside Colin Farrell, Sam Rockwell, and Christopher Walken. What went wrong? Only this: “The director was a jerkoff. He wanted a whole lot for nothing,” Rourke told Moviefone. Any last words for Oscar-winning filmmaker McDonagh? “He can go play with himself.” Noted.